Confession time… How many Done for You Programs do you have sitting on your desktop that you haven’t done anything with yet? Or maybe you’ve run it once or twice but want to make it more of your own and aren’t sure how? In this post we’re going to walk through 6 tips that will help you brand and implement your DFY signature program quickly so you can use it as your main offering in your business because it’s not doing anyone any good sitting on your desktop. Even if it is “done for you” I know that it can still take a tremendous amount of energy and effort to get all the pieces set up and the technology working for you, nevermind what it takes to actually launch the thing. I am here to reassure you that it is possible to grow your health business with one single offer. When you’re first starting out, it’s likely that not many people know about you. It’s likely that you don’t have a big email list. It’s likely that you don’t have a large social media following. It’s likely that you’re going to put in all of this time, energy and money and you’re going to launch the thing that you’ve been working so hard on and not many people are going to buy it. That’s how it goes at first. That is the sequence of events that happens when you’re just starting out. If you’ve launched your program and it didn’t go as planned, it’s okay. Inside the Wellness Business Academy, I often say that the first time that you launch is just to get the entire thing done. Then once your program is done you can switch gears to focus on list building, community building and to positioning yourself as an expert. It’s hard to focus on multiple things at one time — getting your program ready for delivery, list building, social media, emails, the sales page etc.. So if you are just starting out and you’re doing your website and you’re trying to email list build and you’re trying to brand yourself and you’re trying to establish a community and you’re trying to just figure it all out, it does feel overwhelming. And of course it does, it’s not going to feel like smooth sailing because you haven’t done it a dozen times. If you’ve made your no plan B commitment, if this is going to be your career, then you need to remember that the first and even second time you launch, it’s just to get it done and to collect feedback. Ok… pep talk over. Here are the 6 Tips to help you brand and implement your DFY program. When you get access to a Done for You Program the first thing you should do is set up a spreadsheet that outlines all of the components of the program (this is a good process for all of the programs you create yourself as well). Set up the spreadsheet based on how you like to organize content. The spreadsheet should outline every single component that you’ve been given or the names of the components that you need to create so that you have a spreadsheet with all of the links that’s included in your program. Create a file in Dropbox or on your desktop and then create subfolders for each of the different components. Then insert the link to those sub folders on your spreadsheet so that when you look at your spreadsheet, all of the links for your program are in one spot. Why am I asking you to do this? Because a lot of the time the overwhelm starts right from the moment that you get access to the downloads page. The overwhelm hits as you’re looking at all of these different components and thinking, “Oh wow. There’s so much here. I don’t even know where to begin.” And then you don’t begin… and I don’t want that for you. You have to start at the beginning by actually organizing the content that you have. Setting up the spreadsheet and organizing the content might take you a few hours but it’s so necessary to set yourself up like this before you even start to make decisions about launching or price points. I know you’re going to want to skip this step but please don’t. It will help you to visualize the way that you’re going to lay out your program and it will help you to feel so much more organized and confident as you move into the other steps. Pick a program start date. Not when you’re going to start selling it, because that’s launching, but when your clients will actually receive the content and start using the program. Once you’ve chosen that date, then you need to announce it publicly because public accountability gives you a hard deadline. It will give It causes you to take action and get it done. Announce it to your community, tell your friends and family and put it on your Facebook page so people will see it. The big announcement gets people excited. It creates accountability for you and it will build your confidence because as you see people respond to your announcement you’ll feel better about whether or not people will actually buy it. Be very realistic about your time availability, your bandwidth, and your tech knowledge. If you are someone who works full-time, has children, has other responsibilities, it might not be realistic for you to launch in a few weeks. You might need two or three months. If you only have a couple of hours a week, then please don’t put that pressure on yourself. Some sort of accountability is really critical especially when we’re sitting at home alone, we have nothing to lose because no one knows that there’s nothing available. By keeping it to yourself you can easily back out it, so announce it. Then do the work. This is where you really need to have done the work to determine your Ideal Client and hone in on your niche, so that you can determine the singular problem that this particular program solves. When I review sales pages inside The Wellness Business Academy one of the common mistakes that I see is way too many promises being made for one program. All of those promises are jam packed into a 6 or 8 week program and it’s just not realistic. You need to pick one singular problem. That’s it. Not get rid of sugar cravings, have more energy and lose weight because those are three different problems. It’s hard to accomplish all of that in a short period of time. Yes, energy will likely increase when blood sugar is balanced, but that’s a side benefit. When you go through the content of your program, always check back to make sure that what you are teaching will support your clients to understand why they have the problem and then how to get rid of the problem. Are you giving them action tasks so that they can do the work that they need to do and comply so that they can get rid of that singular problem? If for example, the problem that you’re solving is bloating, the singular problem you’re solving is bloating. That’s it. I know the self-doubt can creep in and you feel like you need to promise more… but you don’t. Of course, once they solve bloating, they’re likely going to solve a other problems as well, but the reason that they’re going to invest in your program is because they don’t want to be bloated anymore. Everything else is a bonus. The path of least resistance means using what you’ve got and making it work for you without adding any more stress or difficulty than necessary. For example, if you’re launching a program for the first time, you don’t need a membership site. You’re going to change and improve the content likely at least three or four times before you get it to where you really want it, so on your first go round don’t take two months to figure out a membership site or any other tech that will just pose a barrier to you getting it out into the world. Use what you’ve already got in place, which is email and maybe a Facebook group. Vimeo, SoundCloud and Amazon S3 are all easy platforms to navigate. You can deliver your entire program via your personal email or your email marketing platform. You don’t need to waste time and money trying to make it perfect (because it never will be anyway). 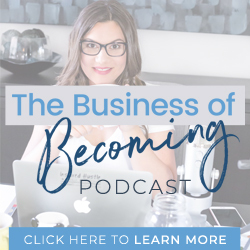 In Episode 4 of The Business of Becoming Podcast, Shawna Kaminski said, that one of the reasons she feels she’s been so successful is because she’s okay to release things out into the world at 70%. Money rewards speed of implementation. Shawna has a 7-figure global business because she takes imperfect action. The key is to take action. If you are feeling wound up in the overwhelm and the anxiety, the only way to get out of that is to actually do the work and take it one step at a time. Even if you have no idea what the next step is. You’ll figure it out when you get there. Just do the easiest thing first and then that will lead you to the very next step. Remember, action alleviates anxiety. This is a place that many can get hung up on, and I get it. But just like the content of your program, the pricing will continue to change over time. When you’re starting, just pick a price you feel comfortable saying out loud where your energy doesn’t shift. Meaning you don’t feel like throwing up a little bit or start sweating. Imagine yourself sitting across from somebody and confidently saying the price of your program out loud… whatever number doesn’t make you sweat is the number to start with. I guarantee that after you run your program once or twice you’ll gain confidence and be ready to increase the price naturally. If you want more tips on pricing your program check out this post. The last, and in my opinion, the most important tip. I know that you need to make money. I know there’s a lot of pressure on you. You’ve probably spent a lot of money and you haven’t made any money yet and there might be people in your life asking things like, “How’s your business going?” or questioning the money you’ve already spent. Remember, you’re just starting to build your business. It’s going to take time for you to make money. You’re doing this with the intent of helping people transform their life. Regardless of whether you get paid or not, (and obviously you do) but it’s in your best interest to detach from the outcome and hold your energy and yourself in a space where you’re doing it with the purest intent, it will change everything for you. If you are only focused on the voice in your head saying things like, I hope they buy. Am I doing this right? What if this doesn’t work… you can’t do the important work of transforming lives and helping people move out of pain. You can’t do your job effectively when you’re in a place of analytics, and scarcity. You can’t empower and teach from that place. I urge you to figure out how to become aware when you slip into fear and what find what works for you to bring you out of fear. The intention is always with my clients’ interests in mind, not my own financial gain because I know that I will gain when I move forward with that energy. If I hold you in the highest regard in everything that we do, then the money will come and I know that to be true. If you have something that is sitting on your desktop, there is no reason that you can’t get it up and running in the next 4-6 weeks in the simplest of ways. Maybe it’s not going to be the way that you wanted it to be. Maybe it’s not going to be this full blown 12 week program, but what if you just did a 4 or 2 week program instead? That’s the path of least resistance. I challenge you to get it done in whatever way works best for you. It’s time to stop being your own best kept secret. There are people out in this world who need to hear your story, who are searching for the solutions that you offer. It’s not going to be perfect. You might not make any sales. That’s the way it goes. But You have to start somewhere and build from that. Want some extra accountability? Join us in the Take Your Health Practice Online Facebook Group and declare your launch date in there so that we can support you and hold you accountable to make it happen. Still feeling unclear? Check out this Facebook Live where I dive even deeper into this subject and coach some members of my community live on their program ideas to gain clarity and bust through the overwhelm.